Repetition is the bane of originality; killing it slowly one overused trope, fabric, rug or carpet, or as is most relevant herein, one colour at a time. It numbs the mind, normalizing the unorthodox, original, and initially truly noteworthy into nothing more than another pastiche thing of which can be said: ‘I’ve seen this before.’ Now this is not to say mass production and its associated efficiencies – perhaps the most readily apparent example of repetition – is in its nature a malignant tumour on creativity, but when one good idea begets inspiration for innumerable worse ideas (and admittedly on rare occasion better ones) the vanguard gives way to the cursed, creation to replication, leading to following, the scintillation of new thought to the banality of trends. This inherent obsolescence exists for no other reason than to sell more wares. 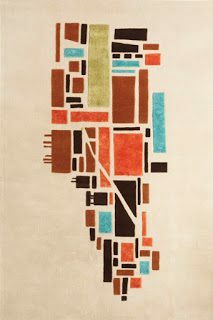 For an industry such as the handmade rug and carpet industry, and additionally high-quality tufted and machine-made qualities, it is disingenuous at best to try and sell a product which can endure multiple years/decades/generations only to then proclaim another is needed when trends – manufactured as they are – change. The impetus for this vociferous denouncement of trends was the 7 December 2017 pronouncement by the bumptiously named Pantone Color Institute™ of that firm’s latest ‘Color of the Year’: ‘Ultra Violet’. Not to be confused with ultraviolet and disregarding the scientific fact that humans cannot see ultraviolet, Pantone wishes to enshrine into societies’ minds that anything not coloured ‘Ultra Violet’, which is presumably pronounced with a brief pause as to distinguish itself from the other ultraviolet, are now passé. ‘We are living in a time that requires inventiveness and imagination. [Editor’s note: As opposed to that time when humanity did not yet have the wheel, or sanitation, or the internet which brings this drivel to you.] 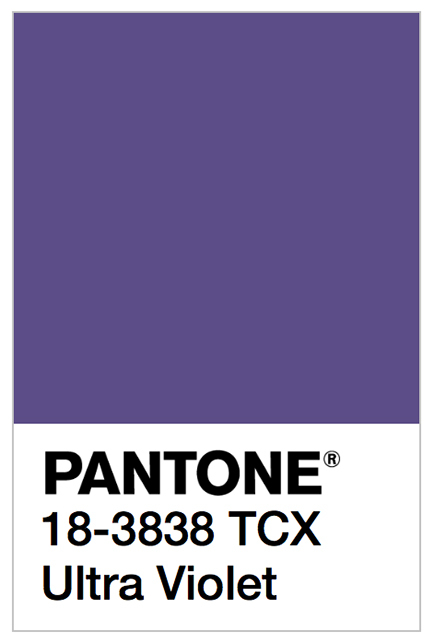 It is this kind of creative inspiration that is indigenous to PANTONE 18-3838 ‘Ultra-Violet’ [sic], a blue-based purple that takes our awareness and potential to a higher level,’ says Leatrice Eiseman, Executive Director of the Pantone Color Institute™ in the firm’s press release announcing the colour. Unfortunately for Ms. Eiseman, ‘Ultra Violet’ itself is neither inventive, nor imaginative, nor does the colour possess any of these things natively, though in her defence it is currently heightening awareness and potential. For you see, there is nothing new – that is: invention or imaginative – about ‘Ultra Violet’ purple, especially given the context of its introduction. The Pantone Color Institute’s 2018 Color of the Year: ‘Ultra Violet’. | Image courtesy of Pantone under the Fair Use Doctrine. Pantone crafted the colour standard ‘Love Symbol #2’ for The Prince Estate. | Image courtesy of Pantone under the Fair Use Doctrine. On 14 August 2017 the venerable colour matching and reference house of Pantone, the very same which now lauds ‘Ultra Violet’, announced their latest Custom Color Standard from the Pantone Color Institute™. Named ‘Love Symbol #2’ and represented by that same unpronounceable symbol the artist formerly known as Prince, but now once again known as Prince briefly went by during his ‘this should get me some more media attention’ phase. 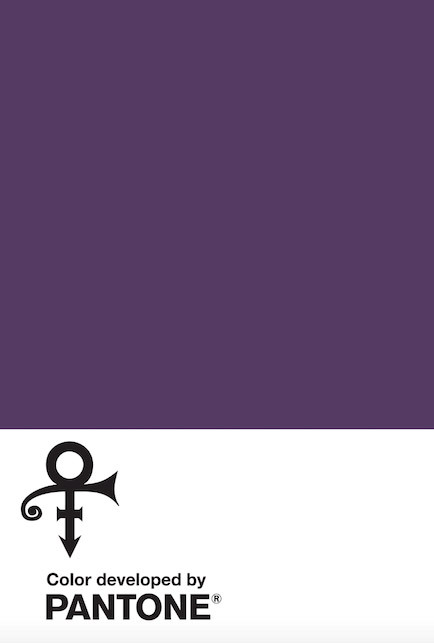 The colour standard – formerly known as purple – was made for The Prince Estate (not yet trademarked) to ensure consistent brand messaging across all platforms. This is of course critical to all enterprises who favour attention to detail (Hear, hear! ), so it is completely agreeable. Moreover, as the Estate is without doubt looking to cash in on the hard work of the now deceased, it stands to reason the powers at be would want a standard with which to extort money from would be licensees. Does anyone fancy a ‘Love Symbol #2’ coloured Kitchenaide Mixer? Well you cannot buy one… …yet… . It also stands to reason that an organization would hire colour experts to craft a standard, and turning to Pantone only makes sense. Their reference system is very well respected and is the standard the world over. It allows ease of colour communication across various media and vast distances with far more accuracy than saying ‘that colour between blue and red’. So for that, praise must be and is given. But as large enterprises do when they think the only way to run a company is through year over year growth and ever increasing returns to investors, Pantone has decided to jump the shark as is said, take some money and tell everyone about it. Furthermore as the modern marketing era is prone to do, the announcement and the description of the colour would have you believe that this colour was ‘invented’ – that is that it never before existed – and the hue will… well, just read into the pompous hubris of this statement: ‘The color purple was synonymous with who Prince was and will always be. This is an incredible way for his legacy to live on forever,’ said Troy Carter, Entertainment Advisor to Prince’s Estate, again from the press release. Methinks Mr. Carter needs to both look up the definition of ‘always’ and ‘forever’ and read of the importance of the colour purple in past civilizations before asking himself if those far more historically relevant facts ring top of mind to the vast majority of people alive today. Hint: They do not and not even a diamond is forever, regardless of what De Beers’ branding would have one believe. The Pantone Color Institute would like to sell consumers a limited edition guide which is the same as their existing guides except it is graced with the 2018 Color of the Year: ‘Ultra Violet’. Whomever thought this up must also not know it’s ‘inaugural’ rather than ‘first annual’. | Image courtesy of Pantone under the Fair Use Doctrine. Returning then to ‘Ultra Violet’: How is a firm such as Pantone to promote their latest greatest colour without offending and denigrating the paid consultancy work from just a few months ago? By tying ‘Ultra Violet’ the colour of the year (note singular case) to ‘Love Symbol #2’ through some crafty verbiage obviously. 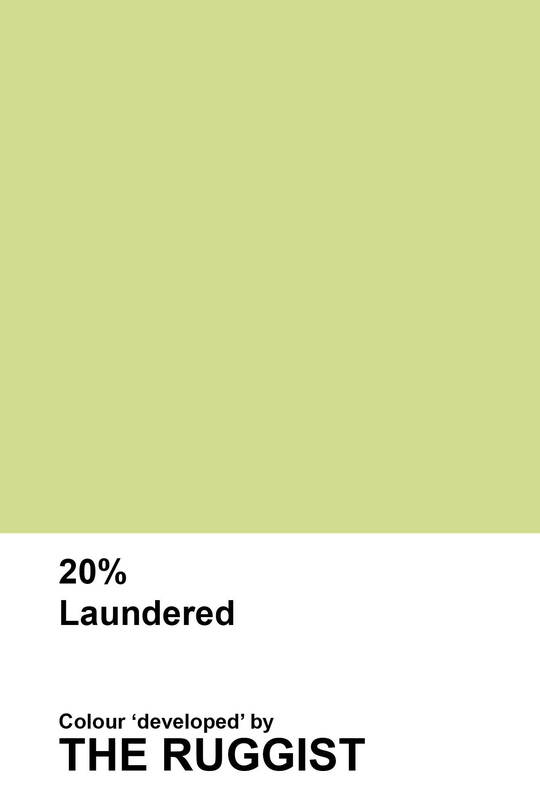 From Pantone’s press release announcing the colour of the year, emphasis added. ‘Enigmatic purples have also long been symbolic of counterculture, unconventionality, and artistic brilliance. Musical icons Prince, David Bowie, and Jimi Hendrix brought shades of ‘Ultra Violet’ to the forefront of western pop culture as personal expressions of individuality.’ Clearly The Prince Estate got what they paid for and more. It should be further noted that while Pantone has always expressed the latest and greatest as the colour of the year – except for that juvenile declaration for 2016 which brought Rose Quartz and Serenity to the forefront – they also backpeddle with plurals for purple and shades as to ensure they can claim, rightly, spuriously, or otherwise, that no matter the precise colour purple used throughout 2018, it is related to the firm’s astute insight. For the colour theorists amongst the population, this of course means only colours created by adding black to ‘Ultra Violet’ should count, but given all this verbiage is simply meant to sell consumers things, it is best to forgo a literal interpretation for something less erudite. Furthermore, is the irony of describing a colour as ‘enigmatic’ not lost on a firm which specializes in precisely describing colour? Another bit of irony can be found in describing a colour trend – trend, noun, /trend/ c: a current style or preference: vogue – new fashion trends – as ‘symbolic of counterculture, unconventionality, and artistic brilliance’, let alone ‘individuality’ but I digress at this point. 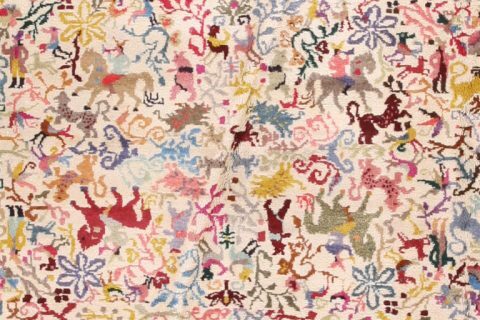 From the handmade rug and carpet world perspective of this commentator there is simply no place for trends when it comes to enduring products. But in a society in which people just want cheap fast fashion, not quality and thus more costly enduring style, these trends – a panacea for the myopic – are the crux of why material and product development favours the ephemeral. So in honour of all that is good and holy, I present the equally as capitalistic, opportunistic, and sycophantic, if not also irreverent and satirical, complementary colour palette(s) for the hues ‘Love Symbol #2’ and ‘Ultra Violet’ which begins, as it must, with… ‘Money Grab’. 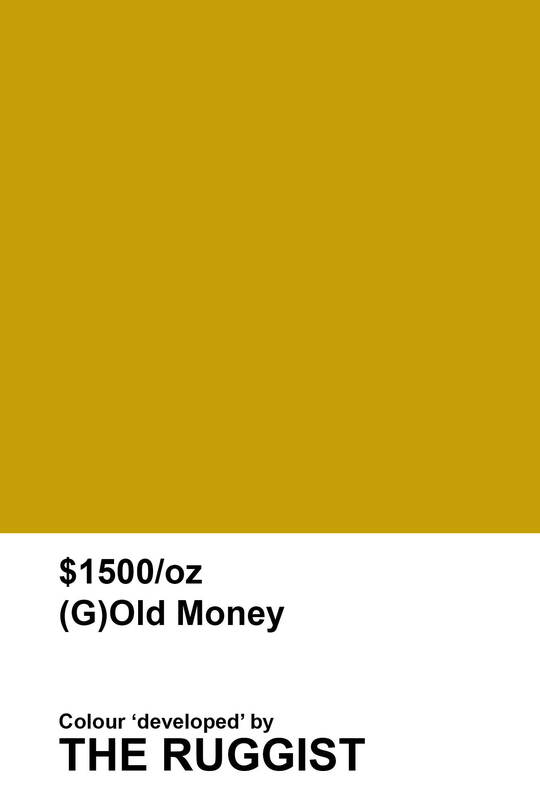 ‘Money Grab’ colour reference as ‘developed’ by The Ruggist. | Image by The Ruggist. 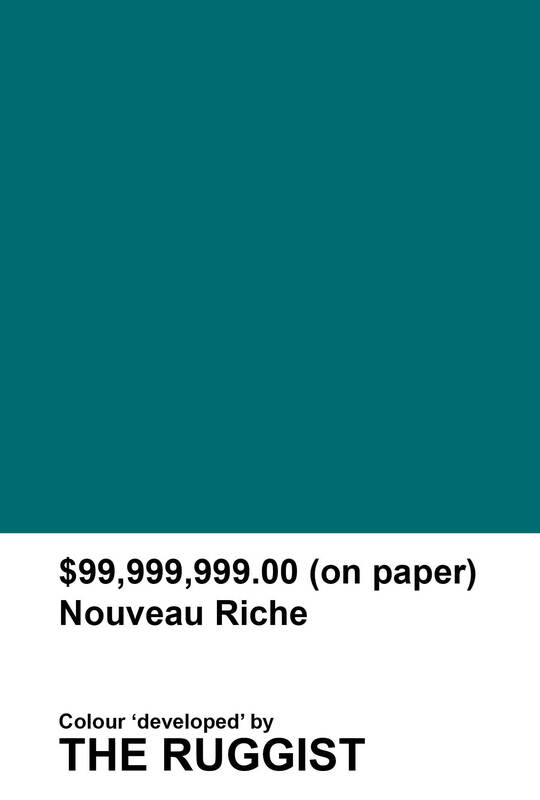 ‘Nouveau Riche’ colour reference as ‘developed’ by The Ruggist. | Image by The Ruggist. 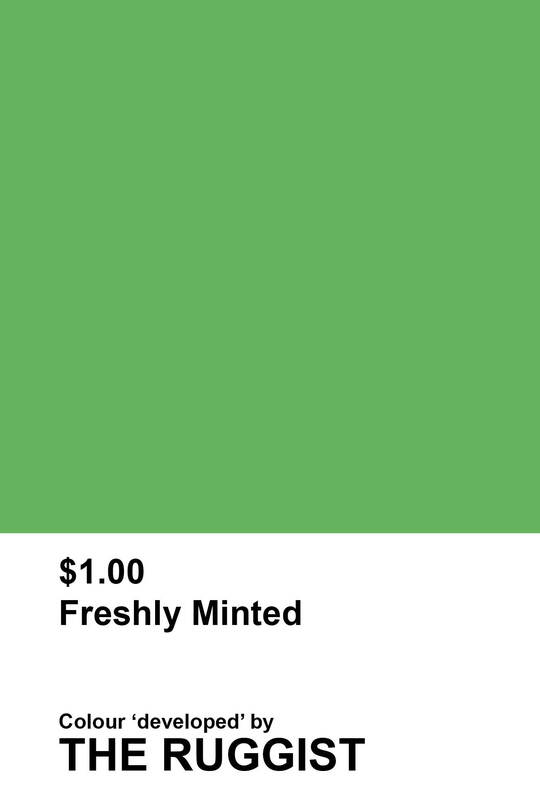 ‘Freshly Minted’ colour reference as ‘developed’ by The Ruggist. | Image by The Ruggist. Known simply by the symbol ‘$’ the hue is literally a triad colour to ‘Love Symbol #2’ and thus technically harmonious rather than complementary, but I digress. Just as the latter was inspired by Prince’s custom-made Yamaha purple piano, ‘$’ was inspired by the former Pantone ‘Color Of The Year’: Greenery. In fact, it’s the same colour, as both ‘Money Grab’ and ‘Love Symbol #2’ represent nothing more than an auspicious attempt to garner attention and make money from work not ones own. But why stop there!? ‘Nouveau Riche’ is a stunning hue whose only description is that it is the best colour in the entire lot, designed solely to be overpriced in order to satisfy the demands of those who equate expense/price/cost with quality, whereas ‘Freshly Minted’ is best used with a high gloss finish as to give the appearance of still being wet. 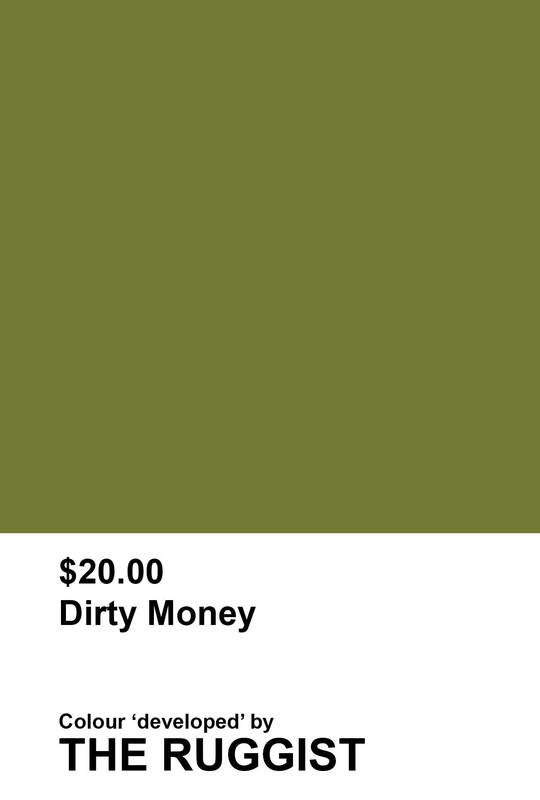 ‘Dirty Money’ colour reference as ‘developed’ by The Ruggist. | Image by The Ruggist. ‘Laundered’ colour reference as ‘developed’ by The Ruggist. | Image by The Ruggist. 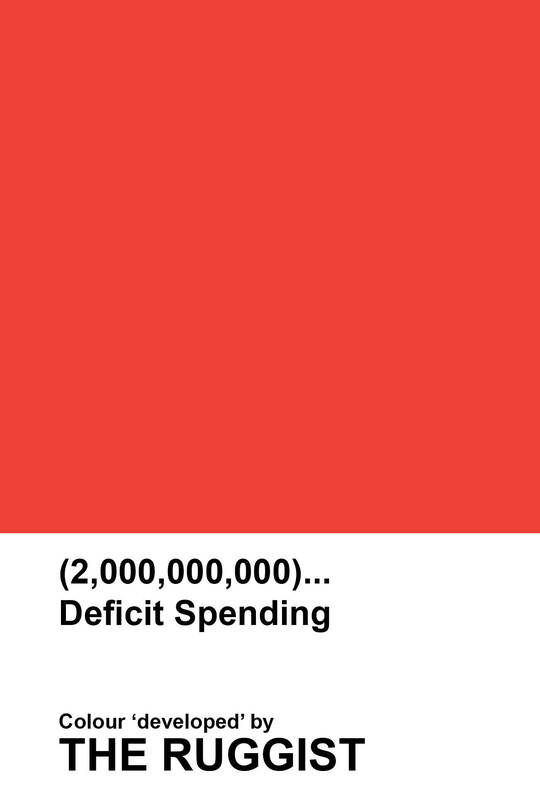 ‘Deficit Spending’ colour reference as ‘developed’ by The Ruggist. | Image by The Ruggist. In the younger days of this commentator (circa 1996-2005) I ran a rug showroom and on rare occasion we had customers who preferred to do business in cash. One such customer once paid a princely sum (pun intended), all in twenties. It was the mid-late-nineties and he said ‘I run a pager business and a lot of my customers prefer to do business in cash.’ ‘Dirty Money’ is named in honour of those pager users. And because after dirty money is spent a few times it goes back out into the world clean as freshly driven upon snow, a derivative colour: ‘Laundered’ comes next. As most of these complementary colours are themed around the concept of money being green, it only seems appropriate to introduce a more classical pairing. ‘Deficit Spending’ works especially well with ‘Money Grab’ during this busy Christmas shopping season. ‘(G)Old Money’ colour reference as ‘developed’ by The Ruggist. | Image by The Ruggist. 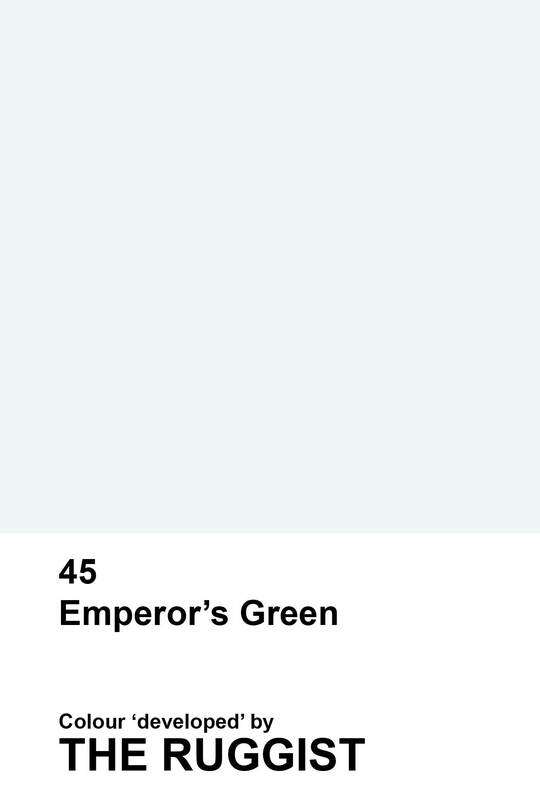 ‘Emperor’s Green’ colour reference as ‘developed’ by The Ruggist. | Image by The Ruggist. With all this red, gold, and green one could rightly assume this article is about Culture Club, but alas it’s just a lame joke. 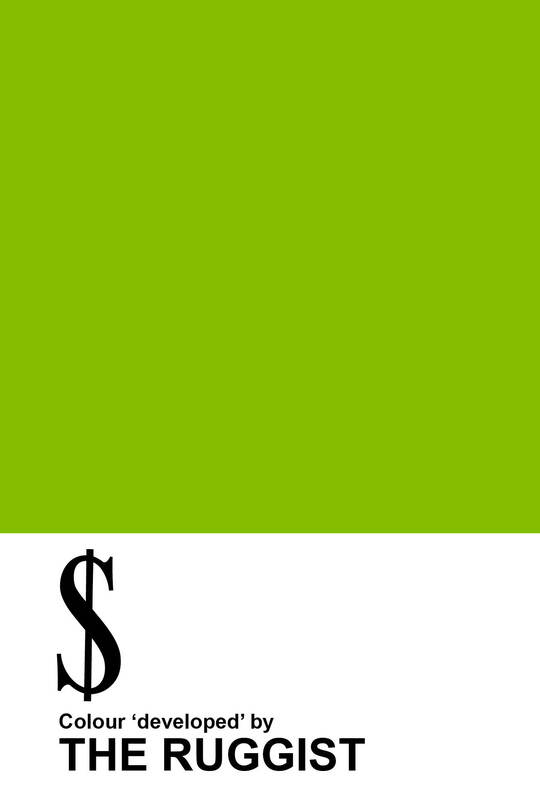 ‘(G)Old Money’ pairs perfectly with ‘Love Symbol #2’ to create a regal combination of historically expensive-to-produce colours worthy of even the most discerning emperors, while the final colour ‘Emperor’s Green’ is so pale and shallow, disingenuous even, one could ask: ‘Is it even really a green?’ So light and etherial, its nature defies description and understanding much like the notion of most of this nonsense. Remember no-one makes or invents a ‘new’ colour; all colours already exist. Moreover a ‘colour of the year’ – no matter what an ‘institute’, organization, group, person, place, or thing might tell you – is nothing more than an attempt to sell something and reinforce conformity. Dare to be a bit different. Enjoy! SALE EXTENDED DUE TO POPULAR DEMAND! EVERYTHING (STILL) MUST GO!